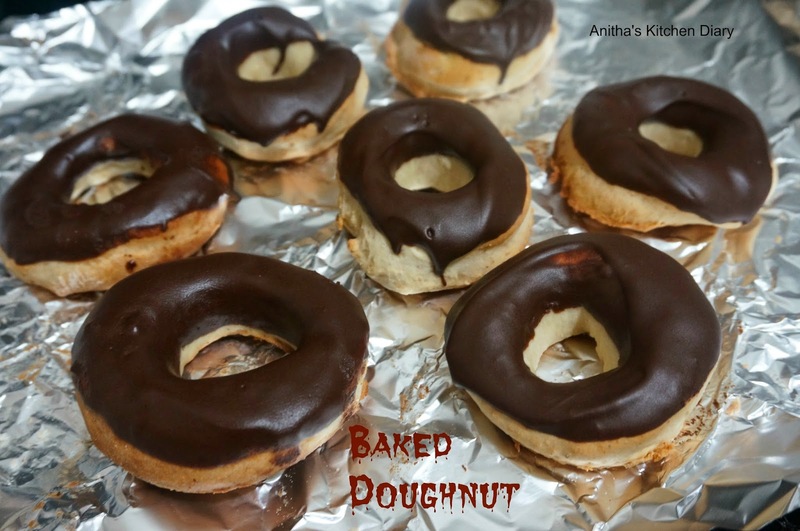 Doughnut is one of the kids favorite dish.These doughnuts are baked not fried and so simple to make.These little baked treats are nice and fluffy.Sending this recipe to Friendship 5 series hosted by Savitha and Geetha as theme of Fast food for Kids. Warm milk in microwave for 30sec , add the yeast to the milk and wait till the mixture raise. In a bowl mix the flour,sugar and butter . Make a well in the center and pour the yeast mixture and form a dough. Rest the dough for an hour in a warm place. The dough will be doubled in size.Pouch down and knead the dough well. Now in clean work surface , dust some flour and roll the dough into 1/2 thickness using rolling pin. Dust 2 round cutter or vessel, one should be smaller than first. Using bigger round cutter or any other round shaped vessel cut the dough. Using another round cutter or vessel t one and make a hole. Melt butter and chocolate chip in microwave for 40 minutes. Stir it with spoon and until no lumps. Dip each doughnut top side and let it dry.You can sprinkle;e any toppings on that.